We provide free, safe rides home for all University of Minnesota-Twin Cities students. Our team of drivers, navigators and operators are students trained in first aid and CPR. Call 30 min before you need a ride. Sunday–Wednesday: 8:30 p.m. to 12:30 a.m.
Thursday–Saturday: 10 p.m. to 2:30 a.m. The Gopher Chauffeur does not operate on University holidays. While you wait, stay in a building or well-lit area. We will call you when the Gopher Chauffeur is approaching your location. Share your Gopher Chauffeur experience on this anonymous survey. Is the Gopher Chauffeur wheelchair accessible? Yes. Ask for the wheelchair-accessible van when calling for a ride. 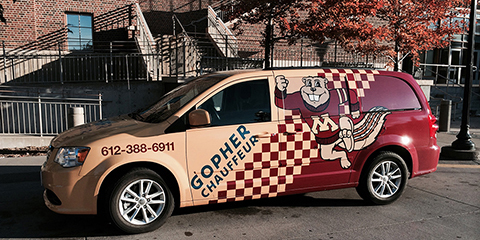 Will the Gopher Chauffeur drive me from my residence to a bar or a house party? No. Gopher Chauffeur only provides safe rides home. Can I eat while in the Gopher Chauffeur? Sorry, but no. Please don’t bring food, or beverages other than water, into the Gopher Chauffeur. We want to keep the vans clean and critter free. Will the drivers take music requests? It’s up to Gopher Chauffeur staff. As long the music does not create a distraction, some drivers may let you choose the music. Do I have other transportation options? Yes. Call Campus Escorts at 612-624-WALK for free walking and biking security escorts. Campus Connector provides bus service between St. Paul, East Bank and West Bank campuses about every five to 20 minutes from 7:00 a.m. through 2:00 a.m. depending on the time of day and academic year. Metro Transit provides bus, light rail and commuter rail throughout the greater Twin Cities area.